As part of our recent webinar on what UK exporters need to know about Brexit in 2017, we polled our audience (mostly made up of UK SMEs) to gauge their confidence about exporting into the EU and beyond following recent developments in the UK’s stance regarding Brexit. In the first question, we asked ‘how confident do you feel in continuing to trade with the EU after Brexit?’ Just under 40% said they were still confident while around 20% said they were not very confident. Very few businesses are not at all confident, while just under 30% are currently neutral. UK SMEs are neither very confident nor completely lacking confidence for continued trade with EU markets. 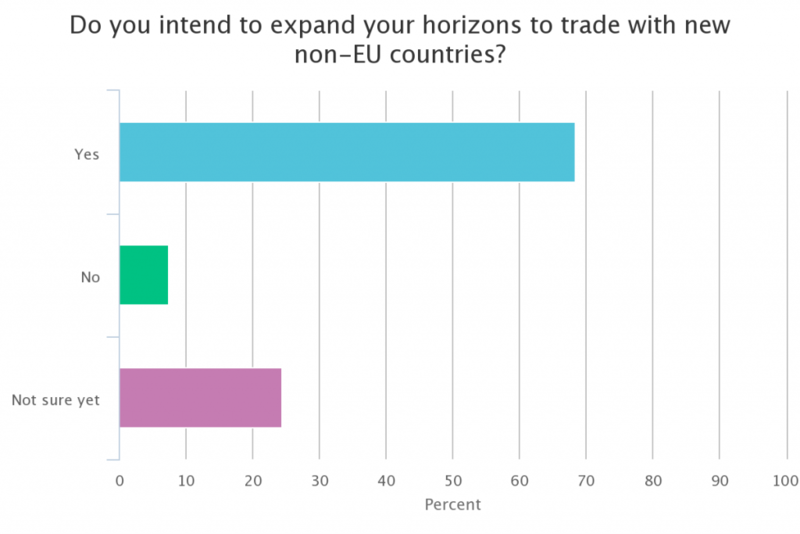 In the second question we asked ‘Do you intend to expand your horizons to trade with new non-EU countries?’ Perhaps backing Theresa May’s prediction of a more global Britain following Brexit, just under 70% said they would be, with around 25% undecided. Will UK SMEs back up Theresa May’s prediction of a more ‘Global Britain’ following Brexit? Following these findings, Open to Export will be hosting the ‘Beyond the EU’ webinar series for the new Global Britain. We will be covering Russia and both North and South America in the series, following our recent webinar on markets in the Commonwealth. Please do have a look at our blog post on the Beyond the EU series.